Notes: An import of what I beleve to be Korean origin and it comes in transparent orange vinyl. The cover is encased in tough clear plastic and the label says "America's Top Jazz". 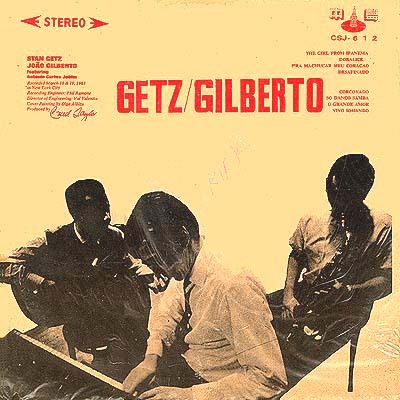 A great record in any case with the Getz and Gilberto duo featuring Antonio Carlos Jobim on piano in a live setting recorded in New York City on March 198/19, 1963. And the session was recorded by Phil Ramone. Samba based and gently swinging its a record for selected for a relaxing evening cocktail with a sea breeze and twist of lime. 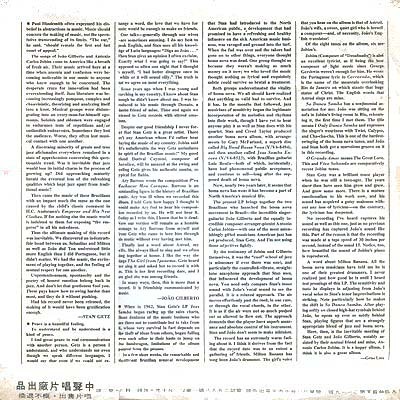 The liner notes say that this session was recorded at 30 ips to capture the full dynamic range of the music. I'll have to trust them on this one as my flea market copy is a bit scratched and war torn. It is listenable though and well worth the time invested.